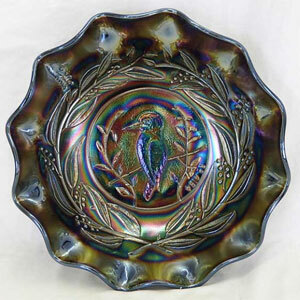 Pattern Description: A Kingfisher sits on a thin branch in the center with leaves on either side. 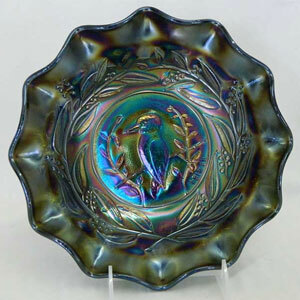 Made by Crown Crystal of Australia, these large and small bowls are primarily found in dark (amethyst) carnival glass and to a lesser extent marigold. The sauces are easier to find in marigold then the larger bowls. 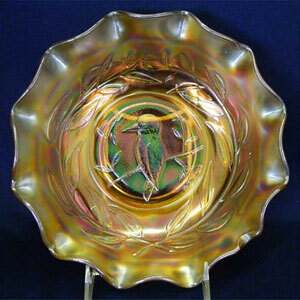 The large bowls are typically 9 to 10 inches across. 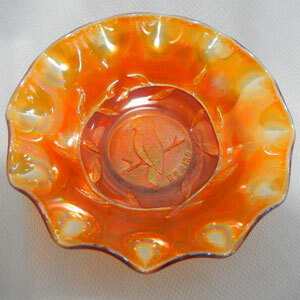 The small bowls are about 5 to 6 inches across. Both size bowls have 12 ruffles.